For calendar year 2018, a "high deductible health plan" is defined as a health plan with an annual deductible that is not less than $1,350 for self-only coverage or $2,700 for family coverage, and the annual out-of-pocket expenses (deductibles, co-payments, and other amounts, but not premiums) do not exceed $6,650 for self-only coverage or $13,300 for family coverage. For a comprehensive chart that compares eligibility criteria, contribution rules, reimbursement rules, reporting requirements, privacy requirements, applicable fees, non-discrimination rules and other characteristics of account-based plans, request UBA’s Compliance Advisor, “HRAs, HSAs, and Health FSAs – What’s the Difference?”. For a detailed look at the prevalence and enrollment rates among HSA and HRA plans by industry, region and group size, view UBA’s "Special Report: How Health Savings Accounts Measure Up", to understand which aspects of these accounts are most successful, and least successful. 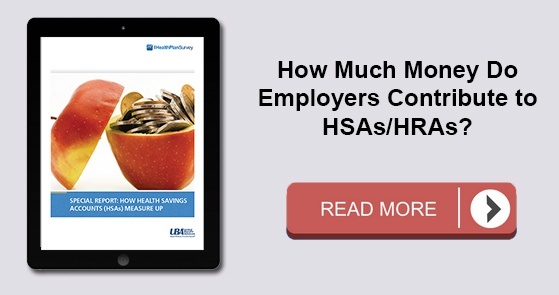 For fast facts about HSA and HRA plans, including the best and worst plans, average contributions made by employers, and industry trends, download (no form!) “Fast Facts: HSAs vs. HRAs”.